Pedestrians are at risk while crossing busy roads where traffic is moving very fast. 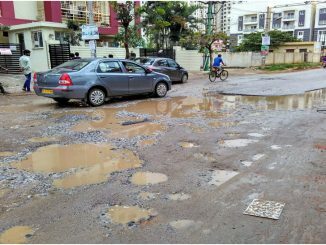 The BBMP has provided a defective and badly designed pedestrian subway at Chalukya circle and a pedestrian elevated bridge near Sophias’ High School on Palace road. The purpose of providing this pedestrian subway is to help students to cross the main road. But children are not using the subway as it is ventilated poorly, filthy, not maintained and risky. The gates of the pedestrian subway are often locked. The elevated bridge near Sophias’ High School, also provided by the BBMP, to cross the main road is not being used by any one including the students. Elevated pedestrian bridges are difficult to climb even for children and should not be adopted for pedestrian crossing anywhere in the city. The proposal of BBMP to provide lifts for elevated bridges is not practical. The lifts will go out of order frequently and BBMP will not attend to them. Elevated bridges are only serving as frames for advertisements. Earlier, the BMTC provided a pedestrian subway at the Shivaji Nagar BMTC bus terminal. Here again, since the beginning, no one is using the subway as it is narrow, dark, filthy, not maintained and risky. Government agencies are wasting their funds on defective public infrastructure projects, which are not being utilized. A solution to encourage pedestrians to use subways is to provide small book stalls, eateries, ice cream parlours, etc. on either side of the pedestrian path. These shops may be leased out but not sold. If the vendors want to close their shop, it should be handed over back to BBMP. No sub-letting should be allowed. The shopkeepers will form an association and maintain and beautify the subway, illuminate the shops during the nights et al. Pedestrians will be attracted to such subways which will serve more than their intended purpose. On one hand development is leading to loss of green spaces, on the other, active citizen movements gives a hope for conservation. Bengaluru’s biodiversity despite urbanisation was the topic of discussion at the event organised by INTACH and ATREE. On the 58th edition of Bus Day, BMTC extends the schedule of 1,500 shifts to 10 pm and introduces a new route from Rajarajeshwarinagar to Kadugodi.